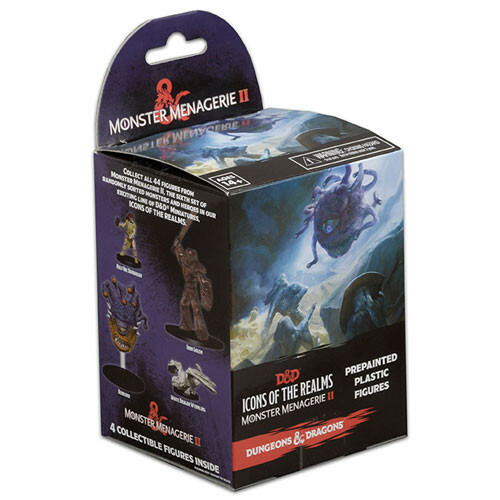 Monster Menagerie 2 brings you a vast array of 44 all-new sculpts representing challenges for your heroes to overcome, and allies to fight by your side. Learn the secret of the sphinxes from the Androsphinx as it tests your courage and valor. Or face the Mind Flayer, the scourge of sentient creatures across the Forgotten Realms. Or stand toe to toe with the powerful Iron Golem, knowing no ambitions, needing no sustenance, feeling no pain, and having no remorse. Will your heroes rise to the challenge? - Each pack contains 4 random prepainted miniatures. I loved this I got some really cool characters for my campaign. These don't have their plastic wrap on them, which leads me to believe they might have already been picked through. Which is convenient considering miniature market sells these figures individually as well. May not be the case but seems fishy. In addition, one the the figures was missing an arm and right after I bought it the price went up. Won't be purchasing these from MM again.